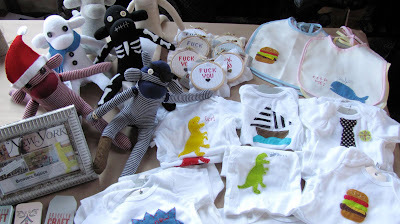 This Saturday's craft fair at 3rd was was so fun! The day passed by very quickly which is always the case with fairs for me (sad). 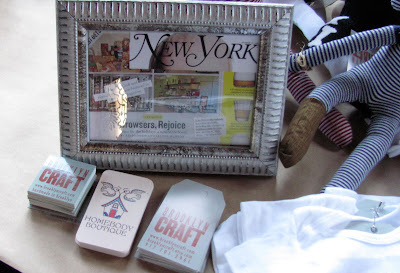 I love meeting other crafters and seeing all the amazing things people are making. There was 2 floors of vendors! We drank bloody marys and screwdrivers from the bar upstairs. I shared a booth with my friend Fionna of FifoCycle Hats. My cousin Clarke came for the whole day and was my awesome assistant. (I think he sold more of my things than I did! )We had a great looking booth! Please look forward to my etsy store renovation coming in the next week with tons of new items and a new layout hopefully!! 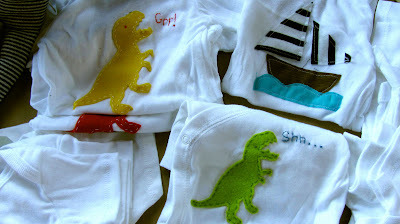 There will be even more onesies and sock monkeys or sale! Congratulations on another successful fair! Everything looks awesome! 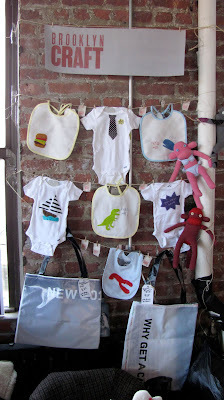 There are a few more stylish Brooklyn babies out there all thanks to your efforts. Well Done T. Sounds like you did pretty well. It was a pretty great show. I am very excited about my pirate monkey!